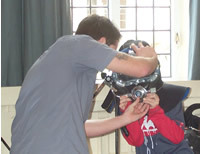 This month at YAC members learnt about underwater archaeology. Brian and Frank, both divers from Wessex Archaeology, came along to tell them what underwater archaeologists do and show them the equipment that they use. For their first task members were given real nautical charts and had to find and mark with a red dot, all the shipwrecks that were marked on them. After that they had a go at wearing the heavy weight-belts that the divers have to use and tried on their diving masks. Then with all their new knowledge of underwater archaeology, groups of members took it in turn to ‘dive’ on a shipwreck that had been set up. They used surveying techniques to plan the objects they found on the ‘wreck’ and even plan the outline of the boat. Each team of ‘divers’ only had 10 minutes of oxygen before having to swap over with the next group. Whilst some were ‘diving’ other members played a game where they had to pretend that they were Roman merchants who had to collect and trade their cargo without being robbed by pirates or shipwrecked. If shipwrecked they had to work out the grid co-ordinates of the wreck site and work out what, if any, of their cargo would be left for archaeologists of the future to find!